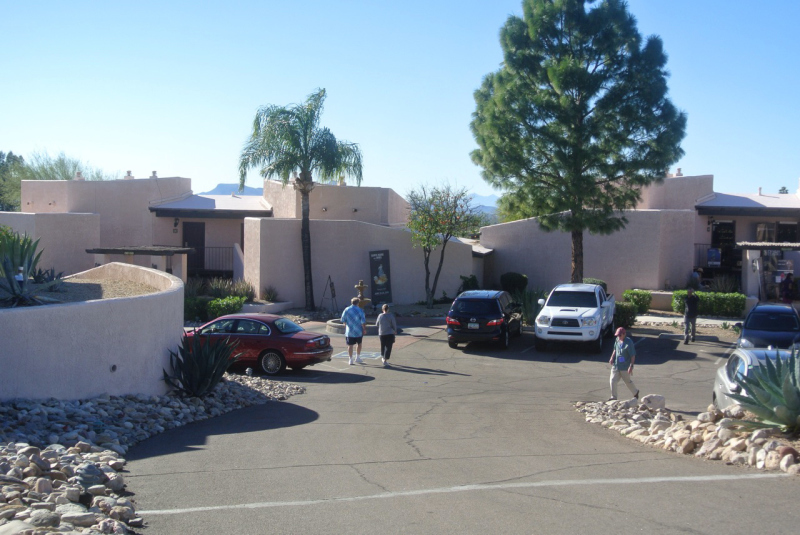 Welcome to our second show report from the Tucson Gem and Mineral Show, this time from the Westward Look Resort in the foothills of the Catalina Mountains. 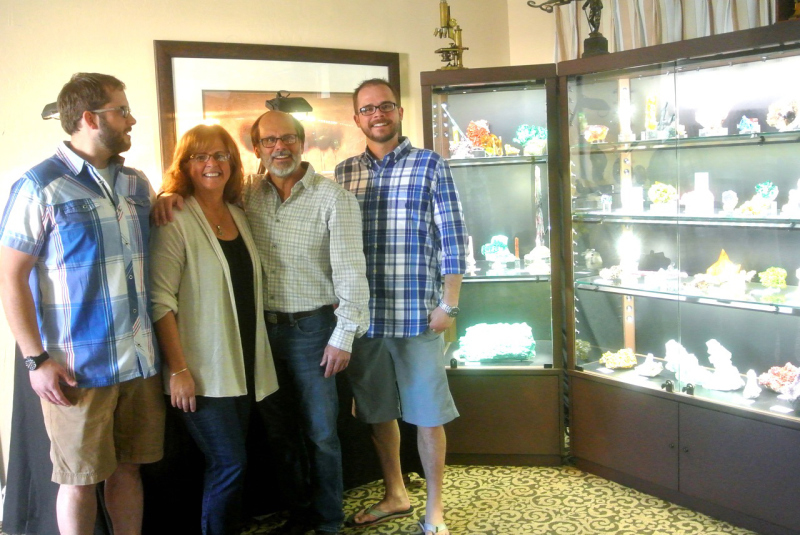 This is the Tucson Fine Mineral Show and we are joined by about 40 other dealers for this four day event. 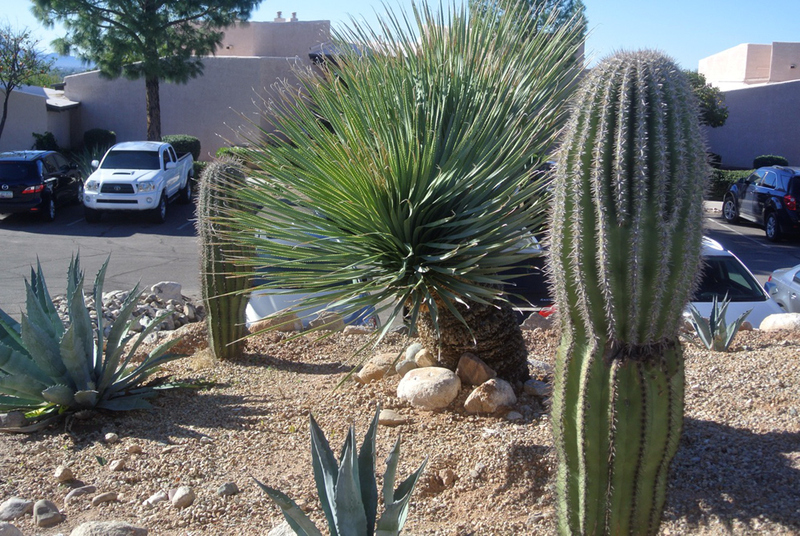 Following the torrential rain the weather is now hitting record high temperatures, with warm sunny days – definitely the Tucson wanted by those leaving snow, cold and rain behind. 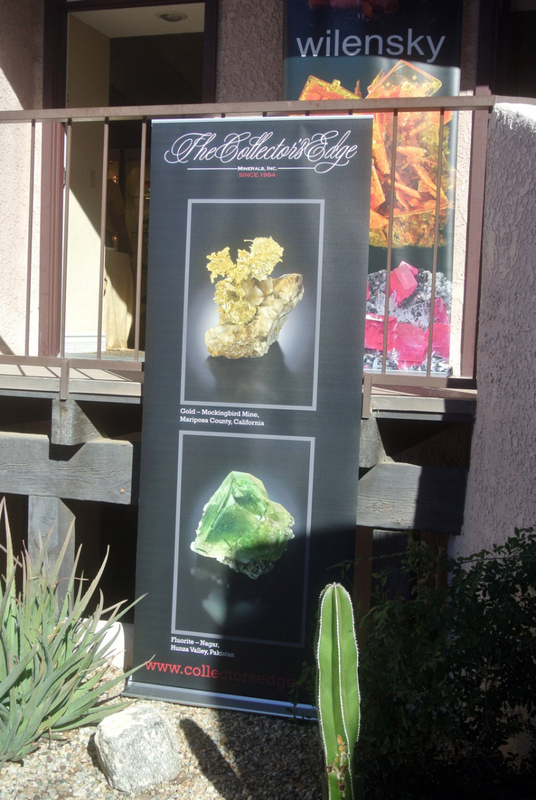 This is one of three Fine Mineral Shows (Tucson, Houston and Denver) and Kristalle exhibits at all three. 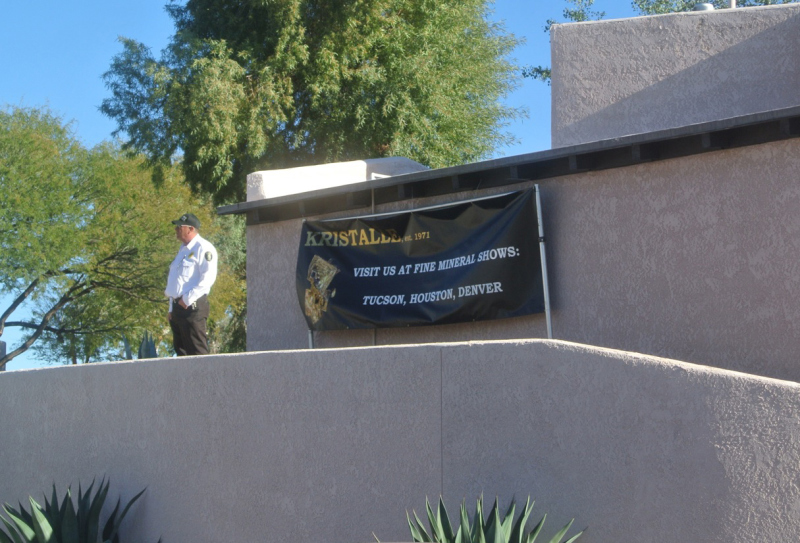 Here in Tucson, the show is now in its fourteenth year. 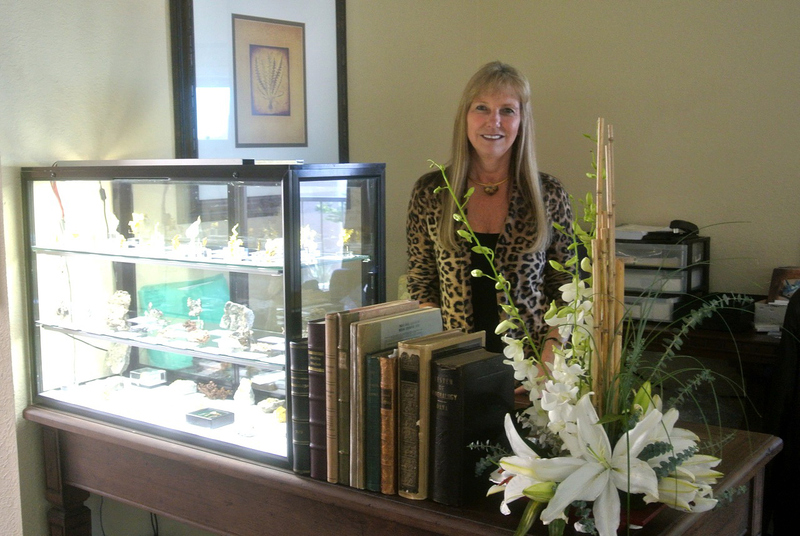 Kristalle is set up in Room 275, with a superb selection of our finest specimens, as well as gold specimens and books. For this report Tana Daugharthy was our gal on the ground at the show finding what was new and exciting, and there were several dealers with new finds at the show. 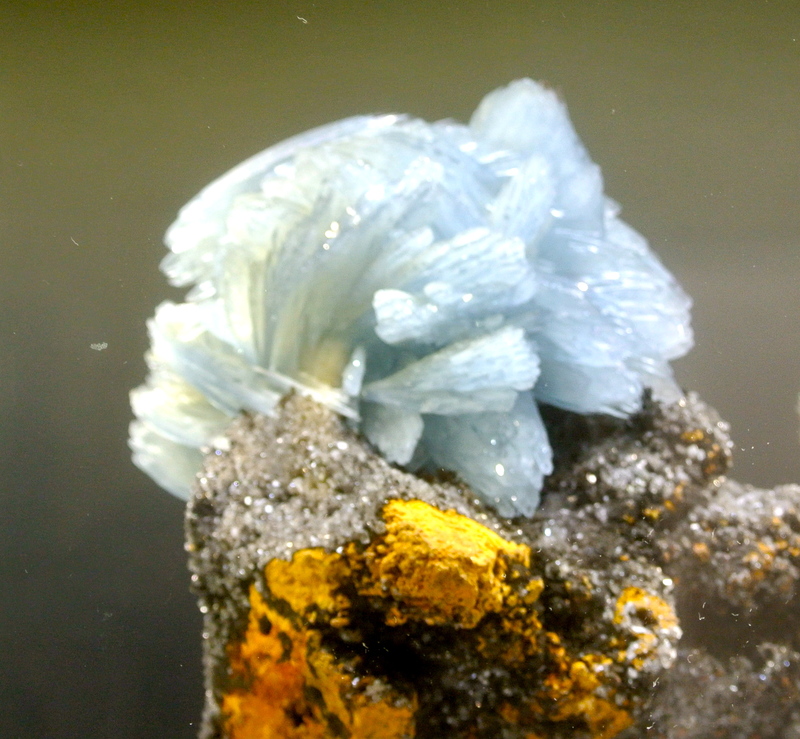 Christope Gobin had a new find of Blue Barites from Nador, Morocco, with lustrous bladed crystals. 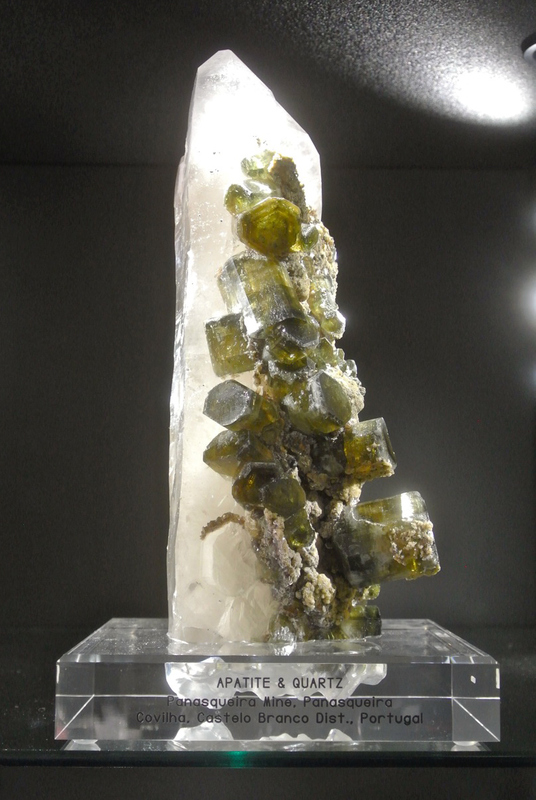 Christophe also had this fabulous Apatite on Quartz specimen from Panasqueira Mine, Portugal with large well formed Apatites of the classic yellowish-green colour. The Collector’s Edge have been extremely successful with their new acquisitions over the last few months and had an outstanding range of new finds on display. 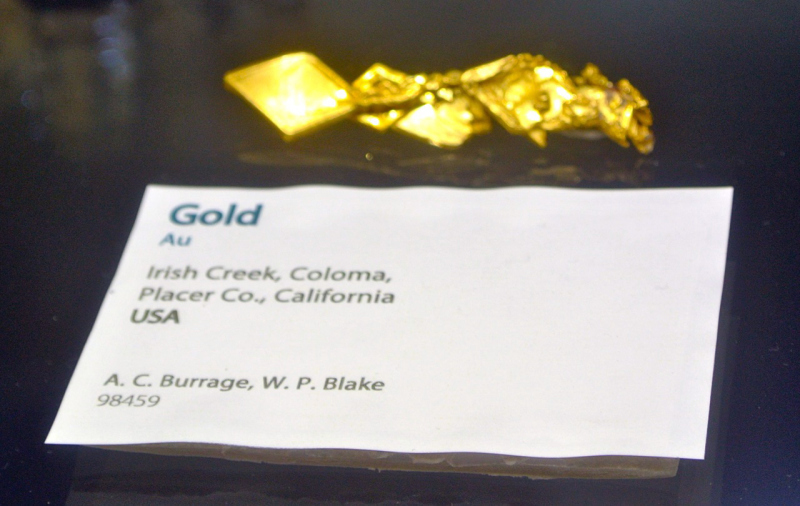 We reported on a few of these at the Arizona Mineral and Fossil Show at the Hotel Tucson City Centre in our first report. They had new Beryl var. Aquamarine specimens from a find in the Hunza Valley, Gilgit, Pakistan, which the Edge consider possibly the finest crystal groups ever collected at this location. We did not get good photos of these but we will try to snap some at the TGMS show for that report. 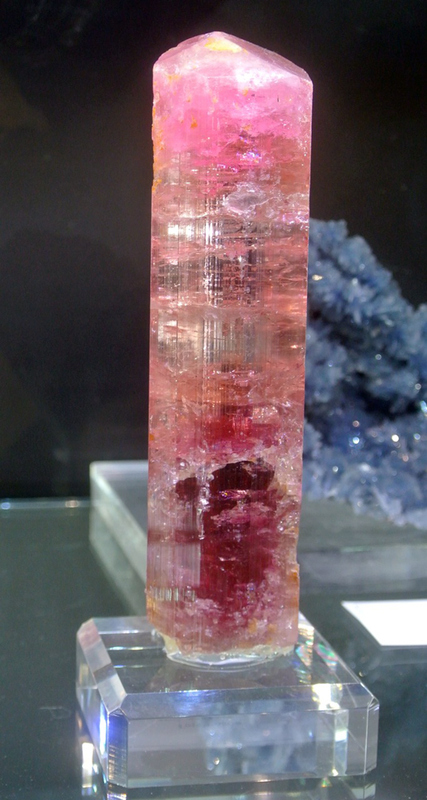 They also had more of the new pink Beryl var. 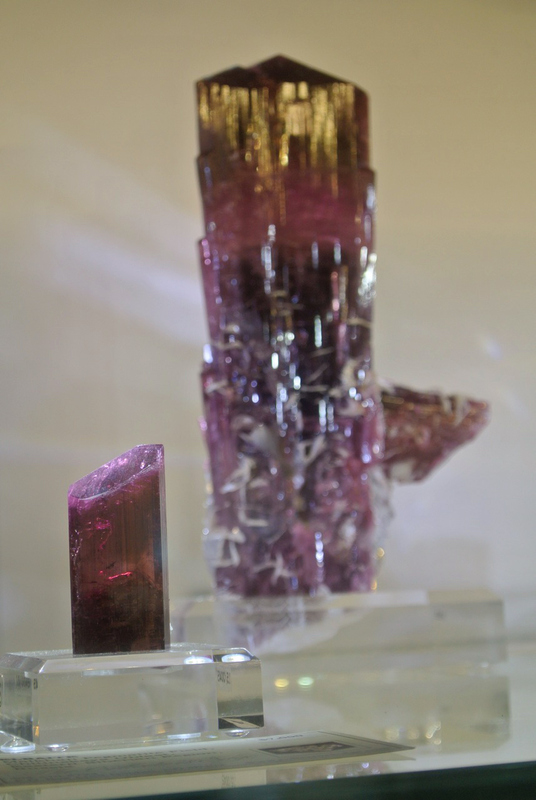 Morganite from Azad Kashmir, Pakistan as shown in our first report. 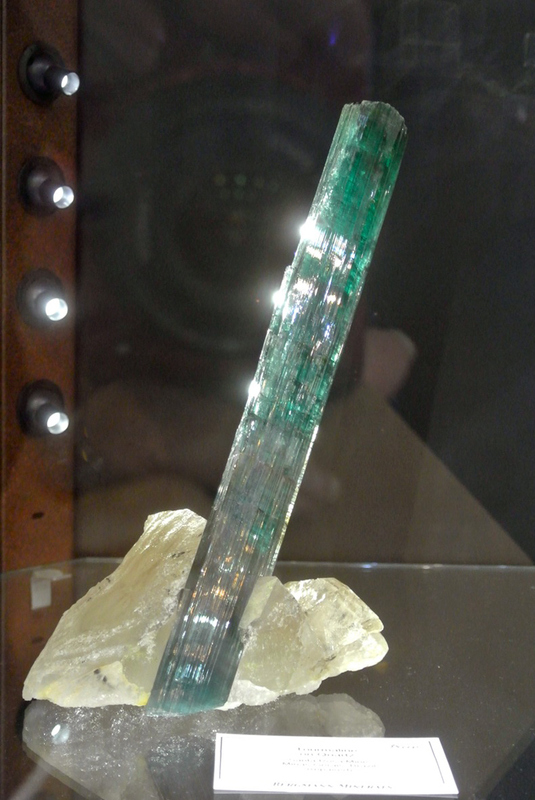 The Edge had a new production of Elbaite var. 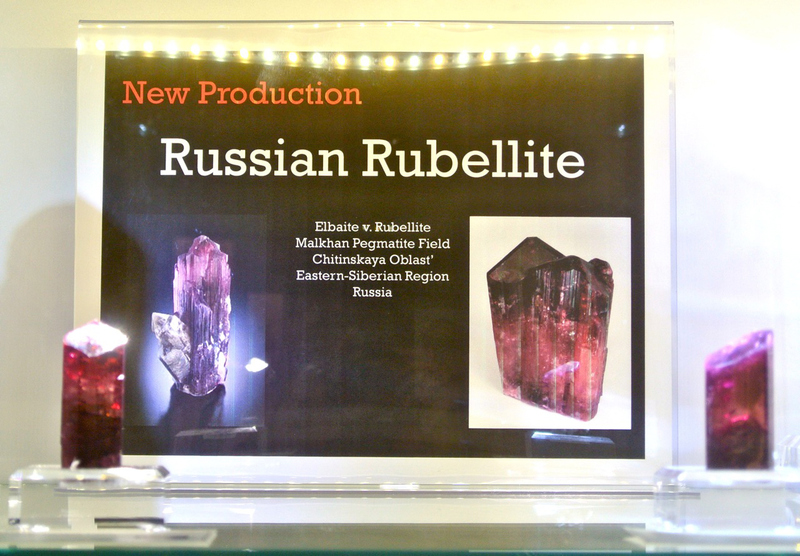 Rubellite from Russia, which had wonderful bright magenta-red colour. 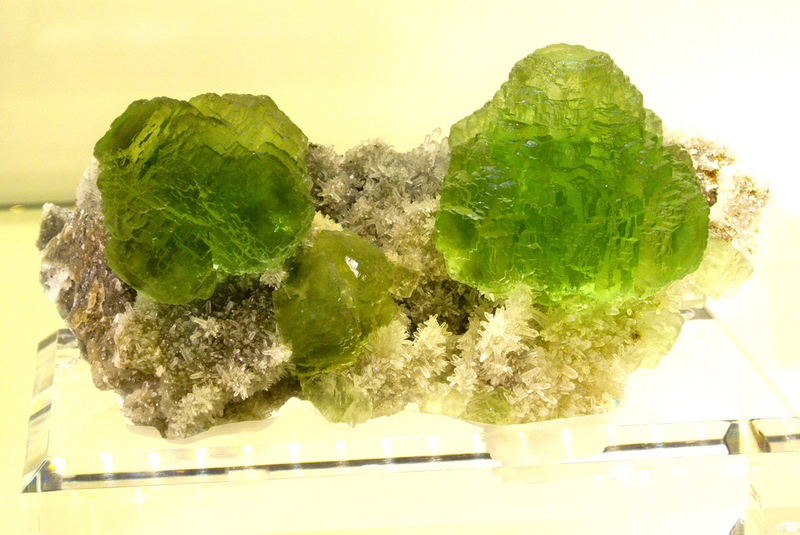 These were from the Malkhan Pegmatite Field, Chitinskaya Oblast’, Eastern-Siberian Region, Russia. 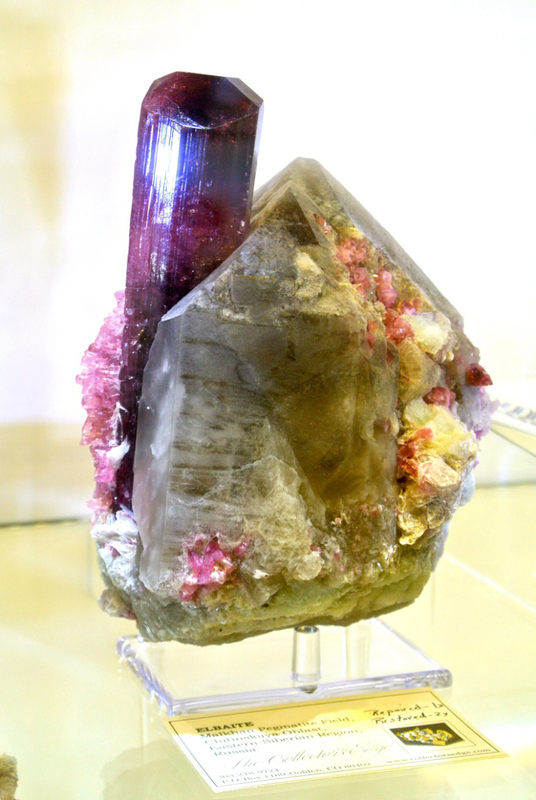 The crystals were translucent with slight variations in colour along the length of the crystal, as single or multiple/complex crystals, and also in association with Quartz. 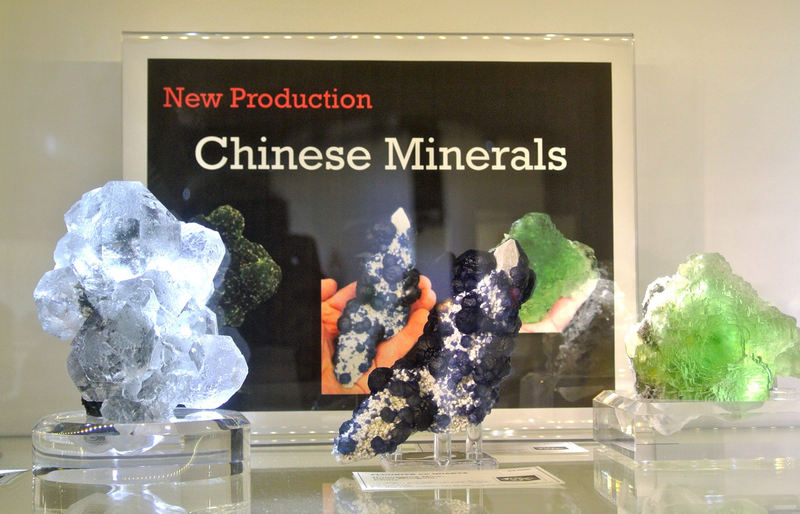 Lastly was the new production from China, including the vivid green Fluorite from Fujian Province, China of octahedral crystals with stepped crystal faces. 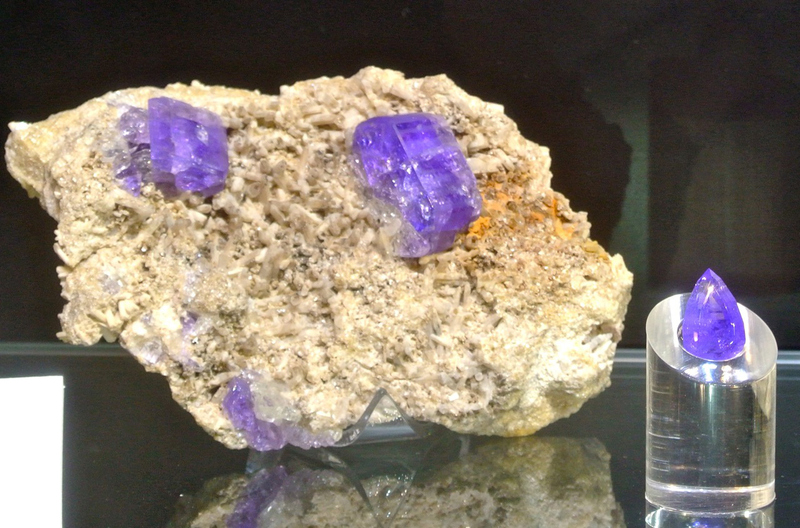 They had more of the wonderful new dark blue Fluorite on milky Quartz from Huanggang Mine, Inner Mongolia, China – this location has been such a prolific producer in the last few years with many new finds including colourless Fluorite, Lollingite , Manganoan Calcite, Hedenbergite to name a few. Another new find of note was superb Dioptase specimens from the Kaokoveld Plateau, Namibia with large crystals forming sizeable specimens. We would venture to say that Bryan Lees and his company has the world covered. 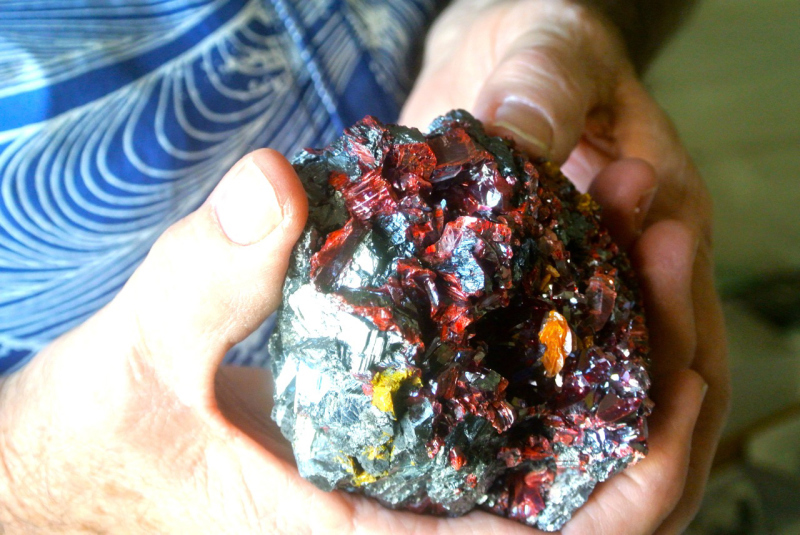 Dave Bunk had a selection of new Coppers from Chino Mine, Grant County, New Mexico, USA. 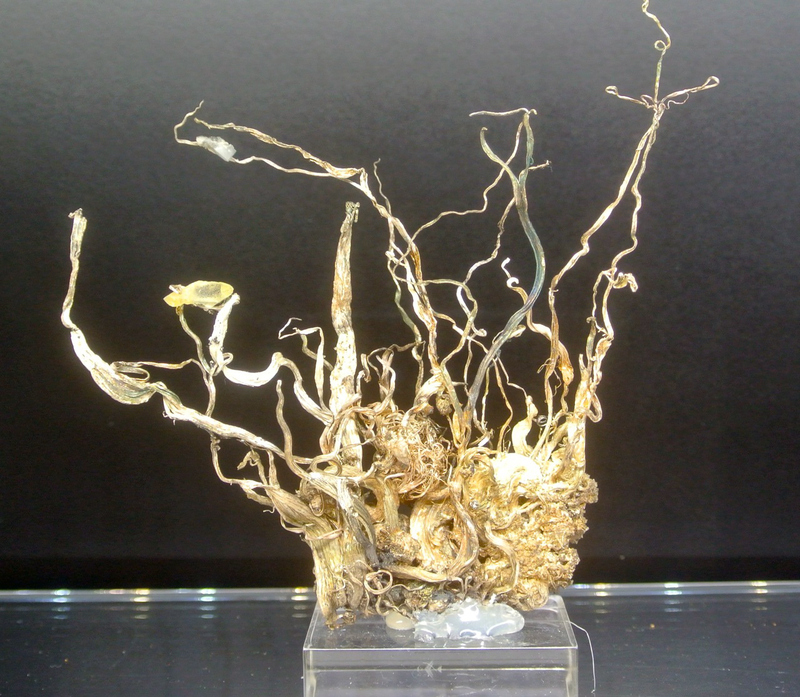 The Copper specimens were extremely well crystallised with herringbone growth, fabulous in person. 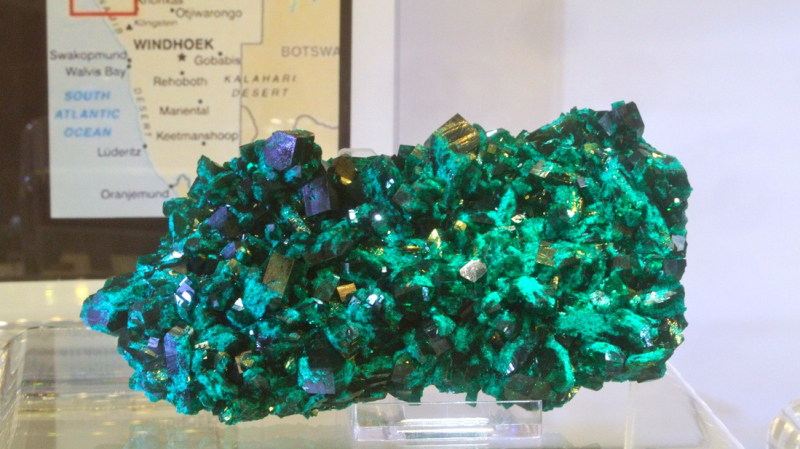 On to the room of Cal and Kerrith Graeber, Cal showed us this fantastic specimen of Getchellite – probably the best ever found – from the type locality of Getchell Mine, Humboldt Co., Nevada, USA. 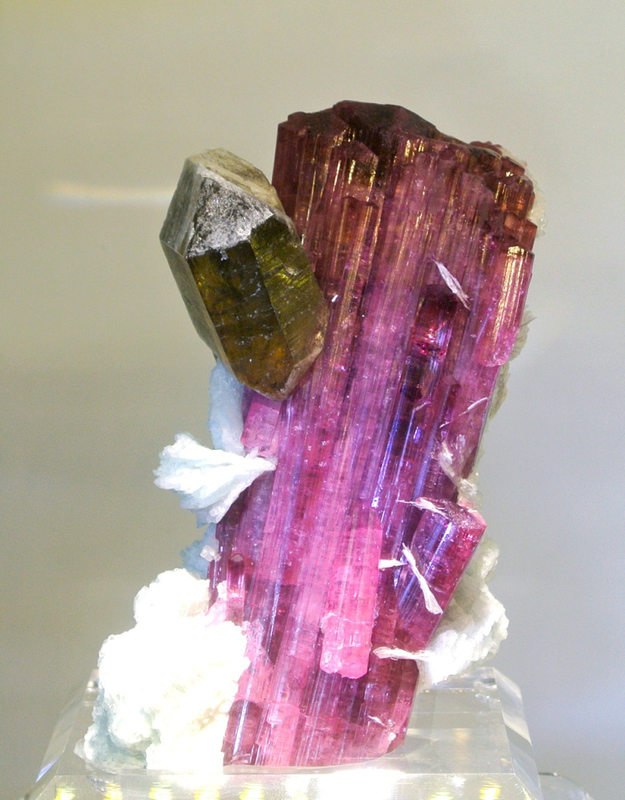 Getchellite is an Arsenic, Antimony Sulphide which forms blood red crystals. Mike and Sally Bergmann are another other lovely couple in the mineral business. 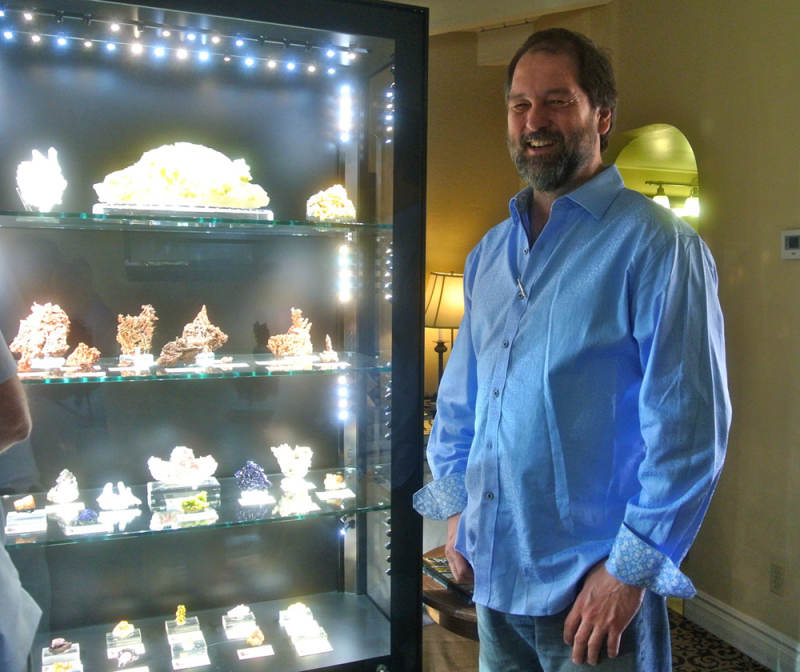 They often have a superb display of gem minerals including many fine Tourmalines, and their room did not disappoint. 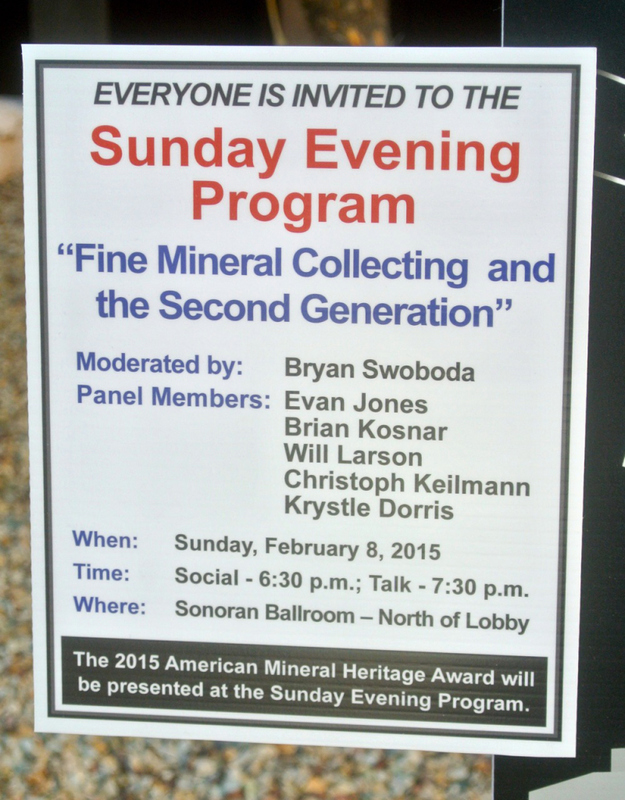 Second generation was the theme of the Sunday Evening Program this year – ‘Fine Mineral Collecting and the Second Generation’ with talks from well know collectors, dealers and show organisers following in the legacy of their parents. The other event at the show is on Saturday – ‘Collector’s Day’ featuring a special collection on display in the lobby. 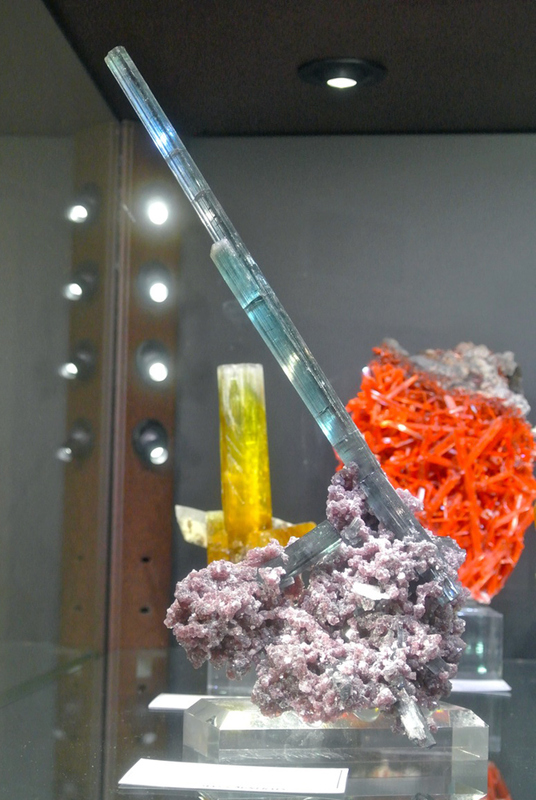 This year it was the Harvard Mineralogical & Geological Museum, displayed by curator Raquel Alonso-Perez. The museum has a history of over 200 years, and contains some amazing pieces. Here are a few of the specimens on display. 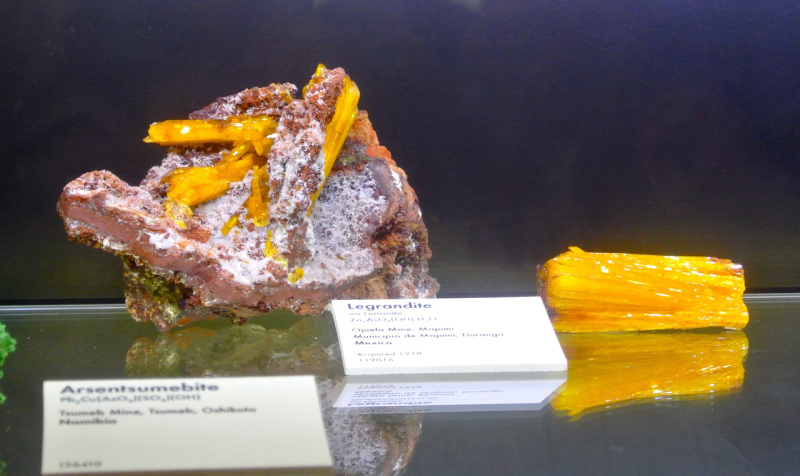 That is it from this year’s Fine Mineral Show at the Westward Look. 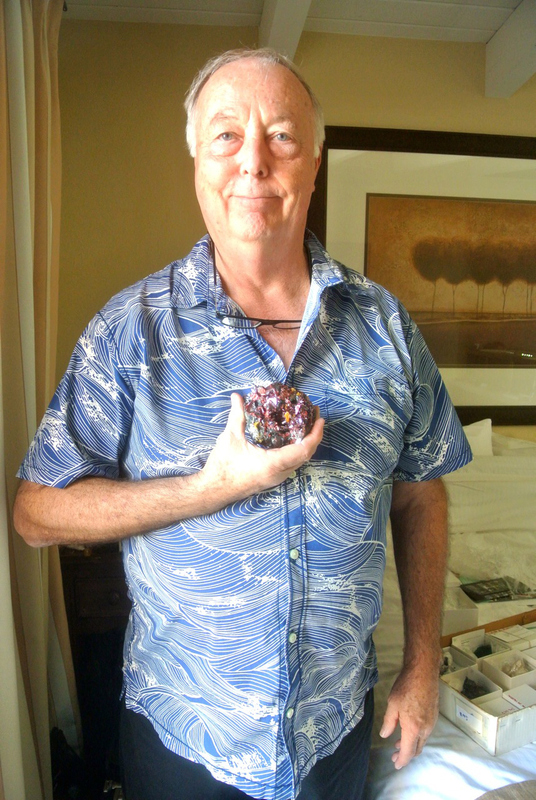 We are now packing down here, and at the Arizona Mineral and Fossil show at the Hotel Tucson City Centre, ready for set up at the Tucson Gem and Mineral Society (TGMS) Show. Always our favorite part of Tucon, the TGMS show should be at the top of every collector’s list of things to do. The displays are always incredible and this is where we ‘fancy up’ our display. We look forward to seeing you at the Convention Center in the next few days!